Set in central Pennsylvania just 15 miles east of Harrisburg, Hershey is famous for its chocolate heritage and its Hersheypark theme park. Hershey's chocolates are still made in Hershey, a town founded by the candymaker Milton S. Hershey. Hershey is 95 miles from Philadelphia; 133 miles from Washington DC; and 163 miles from New York City. While most visitors arrive by car, Hershey is accessible by plane via Harrisburg International Airport, about 12 miles away, and by train via Amtrak, which provides rail service on the Keystone line from New York City and Philadelphia to the nearby towns of Middletown (9 miles away) and Harrisburg (13 miles away). Hershey is fairly small and easy to navigate. 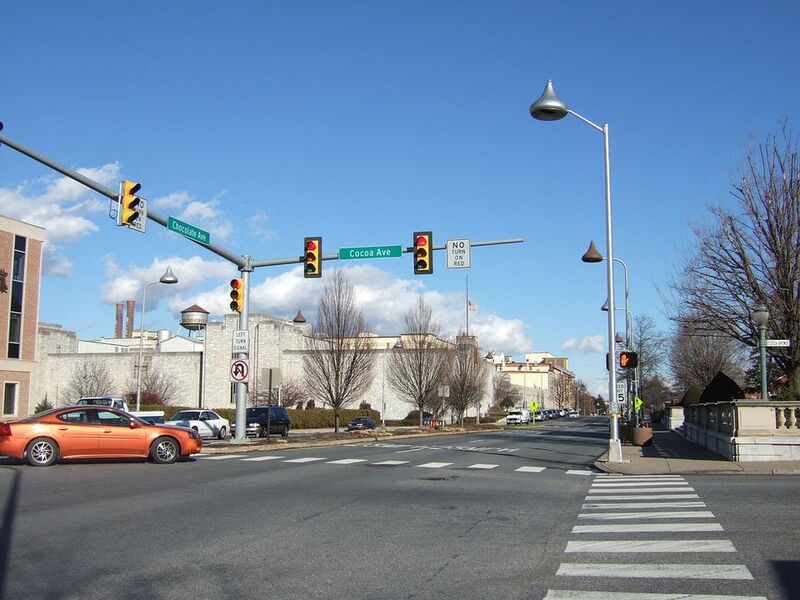 The two main arteries running through Hershey are U.S. Route 422 (also known as Chocolate Avenue), which comes into Hershey from the east, and U.S. Route 322, which comes into Hershey from the west and southeast. The two roads merge at the western end of Hershey, at an interchange with Pennsylvania Route 39, which brings you to Hersheypark and Chocolate World. 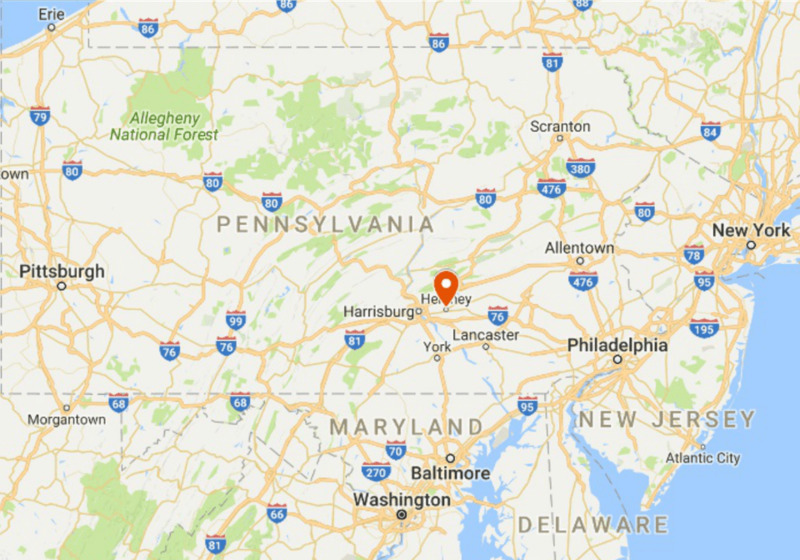 There are many budget hotels in the area, which includes Hershey and neighboring Hummelstown, just southwest of town. You'll find several chain hotels located within a few miles of Hersheypark, and some are less than a mile from the theme park. There are three official hotels affiliated with Hersheypark: the luxurious Hotel Hershey, mid-priced Hershey Lodge, and budget-minded Hersheypark Camping Resort. Hersheypark covers 110 acres, which includes the theme park, the Boardwalk Water Park, and ZooAmerica. The park's main entrance is near Hershey's Chocolate World. The park is well-known for its excellent array of roller coasters, which includes adrenaline-boosting thrill coasters, classic wooden coasters, and even a few kiddie coasters perfect for a child's first ride. Hersheypark's water park, called The Boardwalk, is located near the Midway and includes 15 water rides. Admission is included with the regular theme park ticket. The water park is open only in the summer, from Memorial Day weekend through Labor Day weekend. Other attractions include ZooAmerica, an 11-acre zoo and wildlife walk; Hershey Gardens, a 23-acre botanical garden; and Hershey's Chocolate World, a visitor center with shops, restaurants, and a chocolate factory-themed tour ride. Hersheypark is made up of six themed areas. The first, Founder's Way, encompasses an area that begins just outside the main gate and continues to a meeting point of three other areas: Kissing Tower Hill, The Hollow, and Pioneer Frontier. These four areas make up the central and southern end of the park, while three other areas, Midway America, The Boardwalk, and Pioneer Frontier, are located on the northern end of the park. Hersheypark's color-coded map indicates minimum height requirements for rides. The minimum height for each ride is designated on signs at each ride entrance that show a popular Hershey candy. This is an easy system for kids to understand; once they know which candy matches their height, they can easily tell whether they are tall enough to ride. If your brand is identified, then that ride is for you. The official measurement station is in Founder’s Way by the Carousel. It makes for a great photo opp. Can I Order Wine and Have it Shipped to Pennsylvania?